We have done the work to find the best nutrition for your best friend. We understand the importance of finding the best dog food for German shepherds, so we have done the research for you. This breed is a notably high-energy canine that needs plenty of protein, complex carbohydrates, and fatty acids. The best dog food for shepherds can be found in all-natural dry or canned dog food types. Most brands offer both, and dogs surely benefit from a balance of a combination of wet and dry food. Sustaining the demands of such a breed requires high-quality, well-balanced nutrition to keep them healthy, strong, and active. Every pet owner needs to pay close attention to their dog’s diet, especially with the problem of deceptive labels used to market dog food. What do German Shepherds like to eat? German shepherds are technically omnivores and will eat just about anything, even things they aren’t supposed to! They, like all dogs, enjoy eating meat, and good natural dog food feeds this demand. A food that has real meat as the first ingredient provides your dog with the appropriate protein that nature intended. When you are searching for the right GSD dog food, buy a type that they like to eat. If they won’t eat it, it isn’t very nutritional is it? We know balance is important, so pay close attention to those labels! If you can’t pronounce the ingredients, move on to one you know exactly what ingredients are included, like meat, barley, rice, and sweet potatoes. We know you care about the health of your pet, so it is imperative to avoid foods like wheat, soy, corn, and corn syrup. These fillers are hard to digest, and often trigger food allergies. The ideal German shepherd food consists of high protein, healthy carbohydrates, and vitamins – follow these basic guidelines. Tips to make certain your high-energy dog gets all the nutrition its body needs to maintain a long, healthy life. Do you have a new German shepherd puppy? It is important to keep in mind the required calories change as your puppy grows. For a young puppy, the recommended daily calorie intake is around 500, and around 2100 calories for a healthy adult. Consult your veterinarian to make proper dietary decisions for your dog. Also monitor your dog’s weight to ensure it falls into the average weight with no health issues such as canine diabetes. As your German shepherd becomes mature, its diet should be reduced to around 1300 calories. As much as you love your pet, try to keep calorie guidelines so the dogs metabolism can keep up with the food he or she consumes, as well as fueling its metabolic system. We love that hard-working, high energy personality, so keeping that fueled without packing on the pounds makes for a happier, healthier dog. Overfeeding your dog only hinders their natural energy and drive. It sends the body into conservation mode, where the cells store excess fats and calories for the winter and the body goes into a lazier state. Feeding it a well-balanced, wholesome, and natural diet prevents this if you feed as recommended. High protein dog food for German shepherds is crucial! Healthy protein from real meat is a great marker for good dog food for German shepherds. This is a lean protein, so the dog builds muscle, energy, and strength. For German shepherds, this element of their diet is one of the most important ingredients, because this is their natural food in the wild that nature intended. Dogs are natural hunters, and they hunt meat for energy. There are other important additions to a good dog food for German shepherds that forms a complete, balanced diet for proper health and digestion. Don’t forget those healthy fats! Domesticated dogs rely on us for their nutrition as opposed to the wild, where dogs receive their fat intake by consuming their kill. The skin of their prey provides a lot of the fat their bodies need to keep up their energy levels and aid digestion. We want our pets to be just as balanced as their ancestors, and this can be achieved by selecting a good German shepherd food. That means verifying the ingredients include fatty acids that come from animal fats. These fatty acids contribute to healthy digestion of the other ingredients the dog eats. In addition, German shepherds are known for slower than average nutrient uptake and this is addressed by a good and healthy German shepherd dog food. Do you think your dog doesn’t need carbohydrates? Think again! Complex carbs are an essential for your pet’s health. Foods like sweet potatoes, oats, barley, rice, and whole grains are fantastic sources of complex carbohydrates that should be included in the best dog food for shepherds. These are packed with vitamins, and the always needed fiber. Do you want to ensure your German shepherd’s food has all the essential nutrients for a balanced diet? Adding vitamins and minerals directly to the food is a great way to keep them strong and physically fit. Much like you would take a daily vitamin to ensure your body’s needs are met you can do the same for your German shepherd. This will help your dog have a healthy heart, healthy joints and productive cell growth. Fresh water is probably the most important element of all! Did you know that heartworm is caused by mosquito larvae? Do you know where this larvae is found? In water that is allowed to sit for long periods of time. On top of this, bacteria and certain fungus or parasites also thrive in standing water. Providing fresh is vital to preserve your dogs health. Many pet owners do not realize the potential harm that comes from refilling the same water dish without proper sanitation. Would you drink from a cup that had slime on the inside walls? No, not only because it’s gross, but also because you are aware it can be dangerous. Dogs are not aware, and it is our job to ensure they have a fresh water supply. Water is the very lifeline we all need to survive, and everything from our blood to our organs need a certain amount every day. Offering exceptional dog food for German shepherds along with a fresh water source and routine vet visits will provide an exceptionally healthy dog for years to come. Like in other Taste of the Wild products, Diamond Pet Food uses high quality and novel protein sources. It also features real fruits and vegetables for carbohydrates. The High Prairie recipe uses bison and roasted venison along with lamb and chicken. It is suited for active dogs who need good sources of energy. Antioxidants to eliminate free radicals for better vitality. Probiotics to support the digestive system and boost immunity. Minimum crude protein of 32% makes it a high-protein food. It has an optimal amino acid profile for dogs. Minimum crude fat at 18% – high fat food provides the energy source necessary for vigorously active dogs. Real fruits and vegetables are used like potatoes, peas, blueberries and raspberries. High protein is not suitable for all dogs. The quality of ingredients alone makes this one of the best German shepherd dog foods. Nutro, a subsidiary of Mars, uses high-quality protein sources and ingredients. It doesn’t use any artificial flavors or corn, wheat, or soy, making it a good food for the German shepherd with a sensitive stomach. The first ingredient is their protein source, farm-raised chicken. Protein and fat levels are moderate with minimum levels set at 21% and 13% respectively. Joint supportive ingredients are present like chondroitin sulfate and glucosamine. Carbohydrate sources are whole brown rice, split peas, sweet potato, dried apples, and blueberries. Added vitamins and minerals to provide balanced nutrition like potassium, selenium, vitamin E and vitamin B6. Nutro is still an excellent dog food choice. Iams Proactive Health caters one of their recipes specifically to large breed working dogs. The Iams formula for large breeds features high quality proteins sourced from chickens and eggs. They have no fillers, soy, or wheat. Their recipes are formulated for sensitive stomachs. The first ingredient is chicken and minimum protein is 22.5%. Minimum fat is 12.5% supplied through omega3 and omega6 fatty acids. Joint supplements are added such as 350 mg/kg of Glucosamine and 35 mg/kg of chondroitin sulfate. Some dogs may be sensitive to egg products. It is not suitable for dogs who should avoid corn. 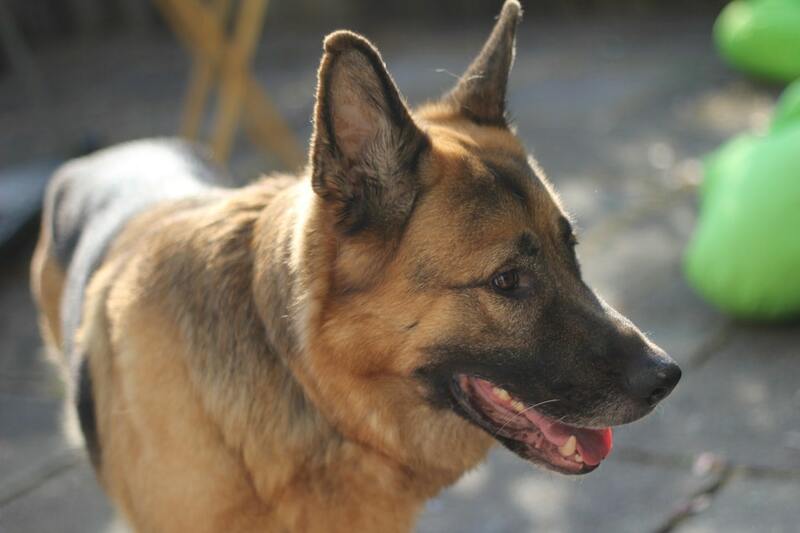 Iams produces a good dry food for the adult German shepherd. As your German Shepherd grows a little older, the way he processes his food often changes. He may not tolerate certain proteins or fats that never adversely affected him as a younger dog. Crude protein is 23% from high quality sources, farm-raised chickens. Carbohydrates are extracted from vegetable, fruits and whole grains like rice bran and barley. Joint supplements are 350mg/kg of Chondroitin Sulfate and about 150mg/kg of Glucosamine. Nutro for seniors is a lower fat diet. Crude fat is a minimum of 12% from chicken fat and fish oil. Omega-3 fatty acids at 0.2% and Omega-6 fatty acids at 2% maintain a healthy sheen to your German Shepherd’s coat. This diet may be too low in fat and protein for active, underweight or chronically ill dogs. 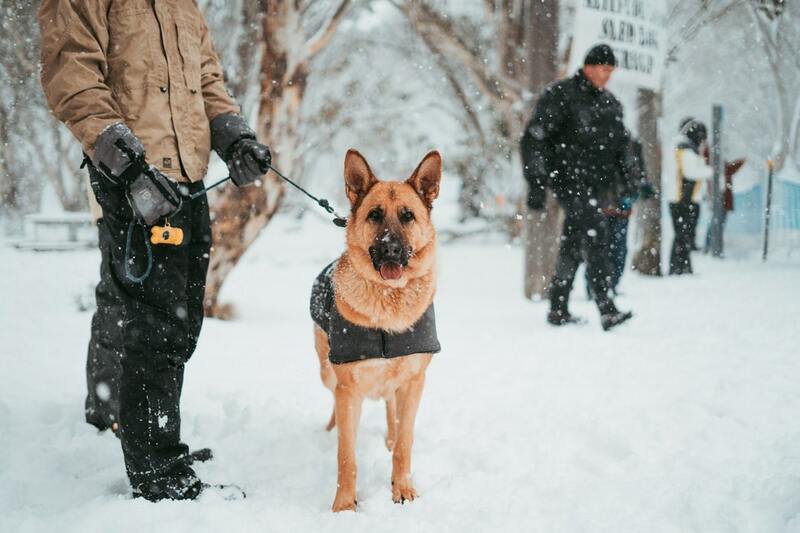 Nutro is a high-quality food for a senior German shepherd because of its exceptional digestibility and its attention to joint health, cognitive function and the immune system. Castor & Pollux Natural PetWorks uses natural and organic ingredients in their dog food. They are the gold standard in food safety, testing their ingredients repeatedly for quality and contamination. There is no soy, wheat, or corn. Minimum crude protein is 25.0% and the first and main ingredient is chicken. Other protein sources are turkey and salmon meal. The diet uses carbohydrates such as whole oats, barley, brown rice, peas, carrots, and sweet potatoes. Vitamin and minerals include calcium and phosphorus among others to provide overall nutritional support. Omega6 fatty acids at 2% and Omega3 fatty acids at 0.25% comprise an overall crude fat contribution of 15%. Pea fiber can cause loose stools in some dogs. The final result of this product is a great food choice for German shepherds. Purina created a line of dog food to focus on unique or special needs that dogs might have. Their Sensitive Skin & Stomach formula uses easily digestable ingredients and novelty protein sources. The key to their recipe lies in their knowledge that sensitive stomach and skin allergies can often be linked. A proprietary ingredient includes Plus Natural Prebiotic Fiber which supports digestive health. It utilizes easily digestable carbohydrates like oats and rice. It excludes corn, wheat, soy, and artificial flavors. The recipe has high levels of antioxidants. Lamb is the primary protein and the minimum protein composition is 26.0%. Some dogs may not like the taste of lamb. Purina supplies one of the best dog foods for German shepherds with skin allergies. Nulo makes a high-protein, low-carb grain free recipe for dogs. They use salmon and sweet potatoes, both easy on digestion. Probiotics are added as further digestive support and to enable dogs to extract more useable energy. The recipe features botanicals that reduce toxins. No grains, gluten, soy, or potato is present. Nulo uses large amounts of animal proteins in their diet which accounts for a high protein concentration of 32.0% minimum. Crude fat is also high at 17.0%. Peas, sweet potatoes, and lentils provide carbohydrates and fiber. High-protein, low-carb diets are not appropriate for all dogs, despite their ancestries. 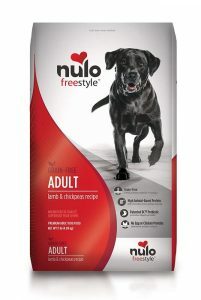 If you are looking for a good Grain Free dog food, Nulo offers a great option. Royal Canin uses a variety of breed-specific qualities based on muscle development, digestive capacity, and jaw size to formulate recipes that cater to breed or size groups. Their Maxi formula focuses on high digestibility and bone and joint support. A sensitive stomach and joint stress can be major concerns for working breed dogs. Royal Canin uses high quality protein with chicken as the top source. Crude protein makes up at least 24% of the composition. The company places heavy emphasis on a savory aroma. Crude fat is 15% with 55% coming from Omega3 fatty acids. The recipe provides carbohydrates via wheat and brown rice. This recipe features wheat if you are trying to avoid grains. This is an excellent dog food for German shepherds with skin allergies. Orijen uses a rich blend of poultry, fish, eggs, vegetables, fruits, and botanicals in their dog food to make it biologically appropriate for all dogs. Orijen is manufactured by Champion Petfoods based in Canada. With the exception of zinc, no vitamins and minerals are added. This is a high protein food at 38%. The protein comes from chicken, turkey, fish, and whole eggs. The top 10 meat ingredients are fresh-refrigerated or flash-frozen (raw diet). Nutrients come from fresh organ and muscle meat, bones and cartilage, eggs and lentils, beans and peas. Orijen infuses freeze-dried chicken and turkey liver to increase palatability. The recipe features a ratio of 85% meat to 15% fruits and vegetables. Fat content is relatively high at 18% and much comes from fatty fish. High fat and protein content does not suit all dogs. Orijen incorporates whole foods from regional sources to produce a high quality dog food for large breed canines. Royal Canin is unusual among dog food manufacturers producing food that account for the special needs of particular dog breeds. The German Shepherd recipe focuses on supporting a high energy dog with the potential for skin, stomach, bone, and joint concerns. The kibbles are even formulated for the unique muzzle and jaw conformation of German shepherd dogs. This diet uses highly digestible quality proteins and unique fiber to help the sensitive stomach of German shepherds. It selects ingredients based on supporting the natural flora of the digestive system. Crude protein is a minimum of 22.0% and the primary source is brewers rice and chicken. Royal Canin provides joint and bone support through glucosamine and chondroitin sulfate and other supplements. Fat is 17.0% and stems from meat and fish oil sources. This diet may not be ideal those who own multiple dog breeds. 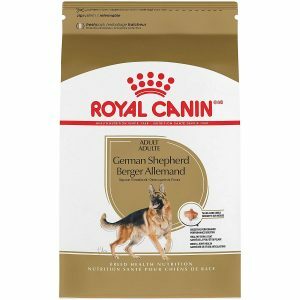 Overall, Royal Canin makes among the best foods for adult German shepherds. Now that you have chosen the best food for your German Shepherd, what’s next? Do you just dump a couple of unmeasured scoops into a bowl and call it a meal? That is a sure-fire way to introduce many problems for your naturally sensitive German shepherd. Determining how much to feed your German shepherd is based on science and decades of experience. We have compiled this information for you. Once you learn how much your friend should eat, you can feed her appropriately and know immediately when her appetite decreases. How much should a German shepherd eat a day? Your German Shepherd will need a set amount of calories in direct relation to its weight and activity level. We also speak about adults here since puppies have different requirements because of growth. Much is different about puppies, so it is a unique challenge to determine what is the best food for a German shepherd puppy. Active German shepherd adults between 60 and 90 pounds need 1740 to 2100 calories per day. You can easily calculate this and use the comparison table included converting that into cups. More sedentary dogs need between 1272 and 1540 calories for the same weight range. Feeding instructions on food labels are rough guidelines. Always adjust food based on your dog’s condition. If your German shepherd is over or under the ideal weight, add or subtract food accordingly and gradually. Finally, German shepherds should consume their calories in a couple of meals through the day rather than at one sitting. Depending on the caloric density of the food, you may need to increase intake ¼ to ½ a cup of food daily for every 10 pounds your German Shepherd is over 100 pounds. 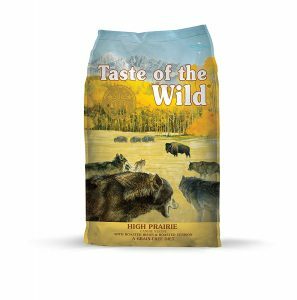 Our top recommendation for the best dog food for German shepherds is Taste of the Wild Grain Free High Protein Dry Dog Food High Prairie. Its high protein and the fat content support the active lifestyle of a large strong working dog. Also key in its selection is how fruits and vegetables complement the formula and how ingredients center around natural foods. Careful addition of vitamins and minerals wraps up a balanced and palatable dog food. We recommend a bag of Taste of the Wild Grain Free High Protein Dry Dog Food High Prairie and watch your German shepherd Dog blossom in health and vitality. 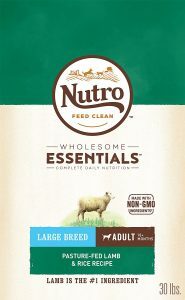 Nutro Wholesome Essentials Original – good if your German shepherd has a particularly sensitive stomach. 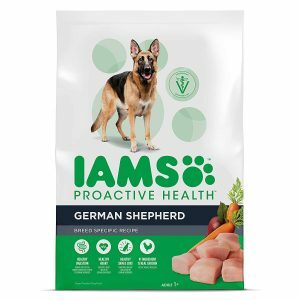 Iam Proactive Health Large Breed Adult Dry Dog Food – this is a quality dog food suitable for German shepherds. It is not recommended for dogs with grain sensitivity. 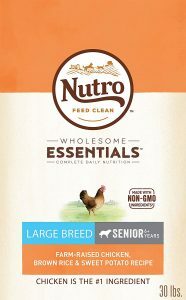 Nutro Wholesome Essentials Senior – Excellent dog food choice if you have a senior German shepherd. 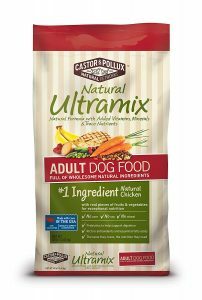 Ultramix Adult Dry Dog Food – The focus is on natural and organic ingredients in their dog food. 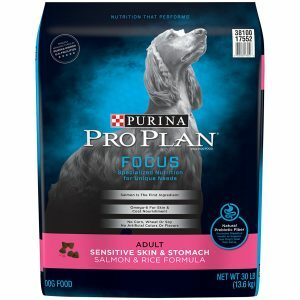 Purina Pro Plan Focus Sensitive Skin & Stomach Adult Dry Dog Food – this is one of the best choices for dogs with skin hypersensitivity or a sensitive stomach. Nulo Adult Grain Free Dog Food – this is a good grain free alternative dog food for German shepherds. Royal Canin Size Health Nutrition Maxi Adult Dry Dog Food – this is another choice food for German shepherds with skin allergies and is formulated for the working dog group. 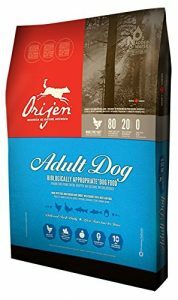 Orijen Adult Dog Food – another choice of high quality food for large breed dogs. This diet most closely mirrors the way wolves eat in the wild. 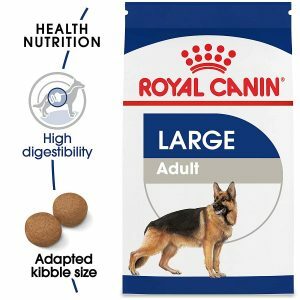 Royal Canin Breed Health Nutrition German Shepherd Adult – a great dog food geared specifically for German shepherds in every way to the size and shape of kibbles.